Blade length : 67.87 cm or 26.72 inches. Sori : 1.7 cm or 0.66 inches. Width at the hamachi : 2.88 cm or 1.13 inches. 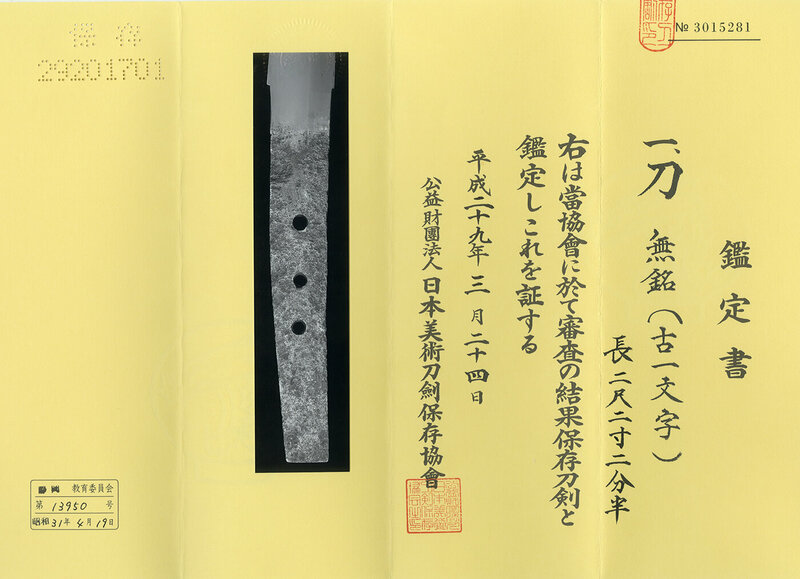 Width at the Kissaki : 1.95 cm or 0.76 inches. Kasane : 0.41 cm or 0.16 inches. Shape : The blade is oosuriage mumei(cut shortened) which is regular width and thickness with deep sori and regular kissaki. Jigane : Mokume hada mixed with Itame hada, jinie attached and utsuri appear. Shinogi ji : Mokume and itame hada. Hamon : Konie deki Cyoji midare and gunome midare mixed rather shimi gokoro. Boshi is notare and hakikake style. Special Feature : Ko Ichimonji school started from early Kamakura period, it is the ancestor of Fukuoka Ichimonji. Muneyoshi, Sukemune, Yukikuni, Sukenari and Sukenobu are famous sword makers from the school. The Hamon is different from Fukuoka Ichimonji, looks similar to Ko Bizen school. From Aoi Art : Ko Ichimonji school has similarities to Ko Bizen school. Luckily the sword has no Bo-hi, you can see the texture of Shinogiji which shows characteristics of swords of Kamakura era. The condition is not so bad for a sword made over 800 years ago, it looks still refined. Historical Background : 1206 Chinggis Hearn unifies Mongolia. 1203 Minamoto Sanetomo became Shogunate Government of Kamakura.